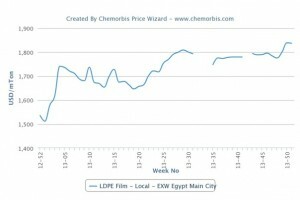 Players in the Egyptian market have been reporting tight supplies of locally-held LDPE this month as per ChemOrbis. There is no domestic production of LDPE in the country, making the market import-dependent for this product. The main source of imports is from the Middle East. 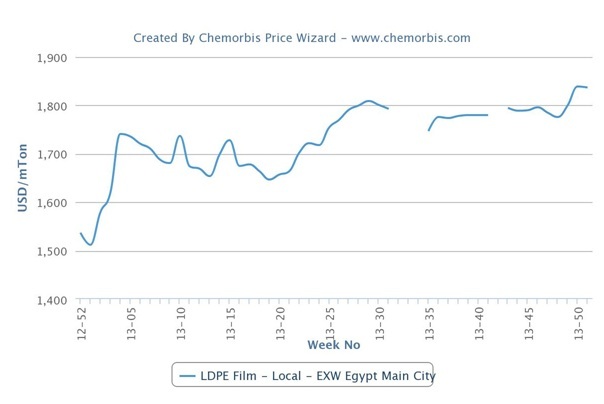 Increasingly tight supplies of LDPE led prices of locally-held materials to carry a large premium of $200-250/ton over the landed cost of imports, after adding $30/ton to the import prices for estimated clearing and handling charges, this week. The current situation is blamed on the fact that import activities have been hampered over the past few months. The political and economic climate in the country had led to pessimistic expectations regarding the market outlook and many players complained of low demand conditions. Many players held off on purchases with the belief that the low demand from Egypt would bring PE prices down. However, a relentless drive upwards in the Chinese market has put upward pressure on import prices to Egypt as that country offered better netbacks to the Middle Eastern producers. Imports into Egypt have also been hampered by ongoing currency issues due to the depreciation of the local currency against the dollar, plus by generally difficult financial conditions due to political turmoil in the country.Some players also complained that shipments have been delayed from the Middle East, which has also affected supply in the local market. According to ChemOrbis, agriculture season, meanwhile, began to pick up starting in October, enhancing the demand for LDPE. The season generally runs from October to late December or early January. Tight conditions have been reported for the past couple of months and prices in the distribution market have risen as a result.